during the NASCAR Xfinity Series Production Alliance Group 300 at Auto Club Speedway on March 16, 2019 in Fontana, California. 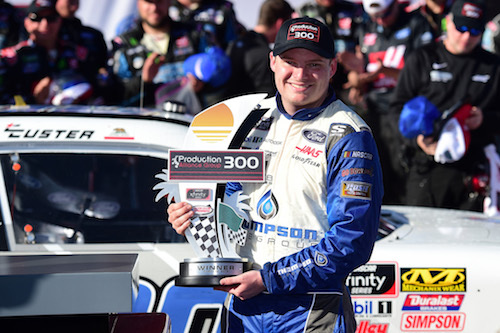 Cole Custer wrapped up the NASCAR Xfinity Series West Coast Swing in his home state of California on Saturday with a win of the Production Alliance Group 300 at Auto Club Speedway. The win was the third-career win for Custer and made the 2019 season the third-straight in which the driver claimed at least one win. It also made Custer the first series regular to win in Xfinity Series competition at ACS since Scott Riggs in 2002. Kyle Busch fell one position shy of his 200th-career NASCAR national-series win by taking runner-up honors after a dominant performance that included two stage wins and a race-high 98 laps led. Christopher Bell recovered from a throttle issue to finish third. Tyler Reddick and Chase Briscoe rounded out the top-five. Busch and Reddick were the only two leaders in the first half of the 150-lap race after starting on the front row with Reddick on the pole. After Busch took the lead on the opening lap, Reddick returned to the lead on the second lap and led 10 laps before Busch retook the lead on lap 12 and led the remainder of the first 35-lap stage. 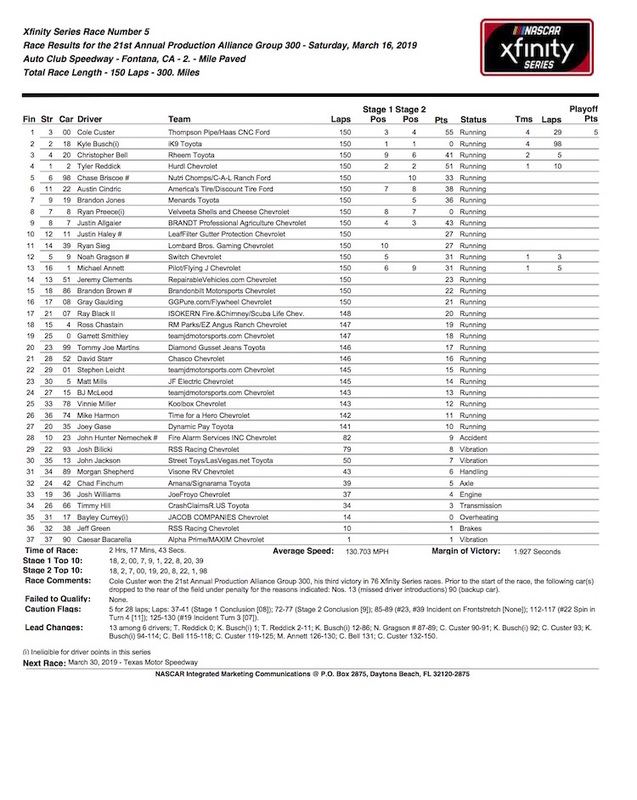 Busch, then, led the entire second 35-lap stage and was still up front when Noah Gragson inherited the top spot by staying out during a lap-84 caution for a John Hunter Nemechek spin. After Reddick ran second to Busch throughout most of the first half of the race, Busch had Custer to contend with in the second half. After both got by Gragson to take first and second in the running order, Busch and Custer traded the lead back-and-forth before Busch recaptured the position on lap 94. During a lap-111 caution for an Austin Cindric spin, Busch had trouble on pit road that was compounded by a penalty for an uncontrolled tire. As a result, he restarted outside the top-10 while his Joe Gibbs Racing teammate, Bell, and Custer restarted up front. Custer took another lead on lap 119. Busch was up to third by the time the next caution, the fifth and final one of the race, came for a Brandon Jones and Ryan Preece incident on lap 124. After Bell and Custer took the top-two spots from Michael Annett and Gragson, who had stayed out during the caution, Busch took second from Bell with about 12 laps remaining as Custer gradually pulled away. Finishing sixth through 10th were Cindric, Jones, Preece, Justin Allgaier and Justin Haley.